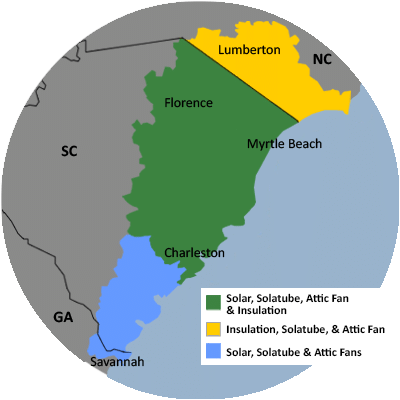 For a FREE no-obligation estimate in Effingham, SC, please fill out the form to the right and Carolina Energy Conservation will contact you shortly. I have a 20' x 24' metal building with 9' ceilings. It has one 8' x 8' roll-up door, and one 36" x 80" door. I don't know the roof pitch, but it's average for standard metal buildings in this area. We specialize in a variety of services aimed to lessen your home's carbon footprint and save energy and money each month! We offer it all, from air sealing to ductwork to insulation and HVAC services in Effingham, SC. For a FREE, no-obligation services estimate in Effingham, SC, you'll also receive a free copy of "Saving Energy and Money at Home," a great book to use as you begin to create a more comfortable, healthy, and energy efficient home!